Give your car a bath at Squeaky Clean Car Wash and Lube Center, then stay for any of our many automotive services. Located at 2381 Foxon Road in North Branford, CT, we’re a full service car wash and lube facility that also provides belt and hose replacements, A/C services, tire services, and more. For our car wash and detailing services, we use Simoniz products that also protect your vehicle from New England weather. Here, no grime is too thick to remove and no vehicle is unwelcome. We’re your local: Car Wash, Truck Wash, Boat Wash, Trailer Wash, Motorcycle Wash, Snowmobile Wash and more! You rely on your car for miles of dependable travel, and your car depends on you for proper care. Be awesome, and bring your vehicle in for an automotive wash or auto detailing service. 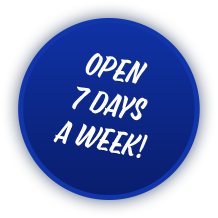 We're open 7 days a week at convenient hours, and we perform a wide variety of automotive services in addition to our washing services. Stop in for an A/C service, oil change, air filter replacement, or belt and hose replacement service. We also have new tires for sale from respected brands like Cooper, Mastercraft, and Falken. We proudly service North Branford, CT, Branford, CT, East Haven, CT, and surrounding areas. Explore our website to learn more, then come see us with your ride.